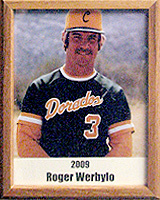 Roger served as head baseball coach at Canyon del Oro High School for eight years (1979-86) and at Pima Community College for nine years (1990-98). His CDO teams won state championships in 1979 and 1984 and were state runner-ups in 1980. He had an overall record of 132-66. During that tenure he earned Coach of the Year honors several times and also was named All-Star coach. Prior to being named varsity coach, Roger coached the freshman and JV squads and also was part of the football coaching staff. After CDO, Roger moved on to coach the baseball team at Pima, first as an assistant, then the head coach from 1990-98. His Aztec teams made the regional tournament seven of the nine years and had an overall record of 297-191. Roger coached 59 players who advanced to four-year institutions, 21 who signed professional contracts and three who played major-league baseball. He coached two ACCAC championships, two regional championships and was the 1992 NJCAA national runner-up. He also won Coach of the Year honors several times. Since 1975 Roger has coached in various amateur and youth leagues, including a Tucson Big League All-Star team that won state, division and regional championships and participated in the Big League World Series in Fort Lauderdale, Fla., in 1979.